Welcome to the war, comrades. You have been selected to receive the latest training and tactics fresh from the warfront. The tried-and-true strategies you are about to hear are extremely effective and CLASSIFIED. Let’s get to the briefing. My name is Geldarion, and I have been assigned to be the new PvP writer for Corellian Run Radio. I am tasked with bringing you the most up-to-date information on PvP strategies and tactics, as well as news from the front regarding changes in warfare. As for my credentials, you might have seen me on my website The Fanatical Swordsman or from one of my advanced class guides on the Gunslinger and Sentinel Official Forums. I have also recently picked up the Smuggler Weekly Column over on TORWars. First a little bit about warfare. 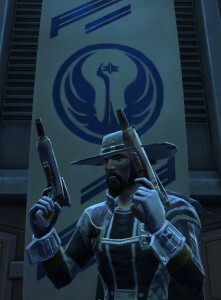 From the first day I played SWTOR, I have also played PvP furiously. I got started in the Beta, and have been PvPing almost daily since. I have played games before that had balance issues in PvP, and for the most part SWTOR has one of the best PvP systems I have experienced. With the recent server transfers and the advent of Ranked Warzones, there has never been a better time to PvP in SWTOR. This week, we are discussing THE number one factor of success in an op. It is one of the most make-or-break, crucial parts of PvP: communication. We have a saying, troops: “Shoot, Move, Communicate.” That is essentially how things should work in a Warzone. Simple things like “w clear” can shift the tide towards victory. Without proper communication, people make bad decisions based on inherently flawed assumptions. Let’s talk about the four kinds of communication we need to use, and then we’ll discuss five tips for better communication. When starting a match, it doesn’t hurt to identify what you are doing if you are a multi-role class. A simple “<—-healer” can make your life easier because more than likely, one of the tanks will put Guard on you, or a DPS might make himself your personal bodyguard. This is important, and as players become comfortable with conventions and playstyles present on their server, it is often forgotten. For example, you might be used to seeing Vanguards always go by themselves to take the turret left off the spawn in Alderaan Civil War. Every time you get an Alderaan Civil War, the Vanguard goes left. After a while, you stop talking about it, and just assume the Vanguard is going left. As long as they always do that, no problem. Then one time, your only Vanguard thinks it might be a good idea to go tank in mid starting out, and everyone is suddenly surprised when you are three-capped. This is flawed communication, which leads to a flawed assumption, and soon the other team will be dancing on the broken wreckage of your ship. A simple “1/4/3” or whatever your plan is will help guide the team to at least know what your goals are. Asking “Who is going left?” doesn’t hurt as well. Don’t figure out the plan while on the speeders, figure it out while the commander is shouting the orders we’ve all heard forever. Things rarely go according to plan, and you must be able to adapt and change quickly when the situation gets sticky to win the Warzone. Telling people in Voidstar “hard west” helps people realize that if they are not busy at east, then there is probably a reason for it. In general, look for the big picture, try to see what WILL happen, not what is happening. If you are alone, guarding a turret, then don’t just do nothing. Start typing. If you are guarding west, type in “west inc,” then click the bottom button on the side of the chat box to keep the message for later. Then, if you are suddenly attacked, hit Enter twice, and you’ve sent the message with less than a global cooldown of time. Don’t forget to update guarded areas with all-clear signals. Saying “west clear” lets people know where the enemy IS NOT, therefore helping your team to figure out where your enemies ARE. We need to remember that the people controlling your team’s characters are in fact just that: real people. They have feelings, they have goals, and they have disappointments. They are equally as upset as you are if your team has lost. If anyone messed up, more than likely they are beating themselves up for it already. If you think they actually didn’t know that they made a mistake, then politely talk to them in tells. DO NOT call them names or insult them in chat. Sometimes it is a legitimately new player, and sometimes it is a player who has a lot more experience than you who just had a bad game. Either way, it is best not to make enemies on your own side. After the completion of a game, always be sportsmanlike and end a game encouragingly, whether that be a “nice work all” or just a simple “good game” or “gg.” Also, if it was a particularly close game, you might even reach over to the other side and /say “close game, enjoyed it” or something like that. People can talk cross-faction via /say, and it helps foster a feeling of community even among players on the other faction. Remember, if you roll a character on the other faction, they become your teammates. Treat them like human beings. As soon as you see someone incoming, say something. There is nothing else so important you could be doing with that time. Let people know if west is still clear, if you don’t see anyone, etc. Also, especially with Novare Coast, there is a lot of scrollback text sometimes (text from the game that fills the chat window). Make sure that you are heard, sometimes you might need to say something twice to cut through the noise. If you can help it, say “west” and “east,” not “left” and “right.” With server transfers, there are a lot of conflicting ideas on which side is left and right. I personally always call it from the spawn, but since that isn’t universal, “east” and “west” is more precise. Always treat others with dignity and honor. Do not berate someone during the match, it fills the chat box and masks potentially important information, and it does not help anyone. Don’t have random conversations in chat during a game, even if you are bored guarding a turret. For the same reason as #4, it could actually hinder your team. Welcome to CRR! Great article, Geldarion. I look forward to more.